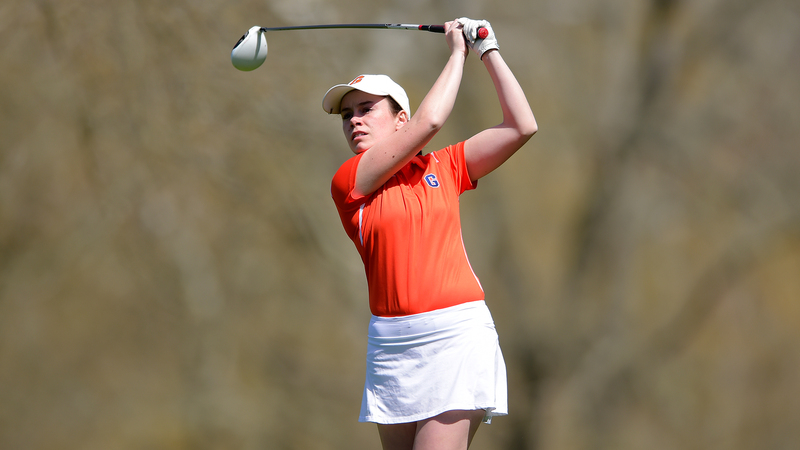 Women’s Golf Takes Down F&M, McDaniel | The Gettysburgian. The Bullets’ Women’s Golf Team has returned to winning form this fall, finishing first at this past weekend’s McDaniel Fall Tri-Match against Franklin & Marshall and McDaniel. Senior Gillian Marini captured her first career individual title, carding a 90 to secure the win by three strokes. She was aided by the lone first-year on the team, Cameron D’Amica, who placed third, and senior Virginia Martin who came in fourth. The Bullets’ are no strangers to winning, having earned the Centennial Conference Championship last spring for the eighth consecutive year and making it back to Nationals. The Bullets struggled early on, finishing fifth out of seven at the McDaniel Invitational on Sept. 8 and third out of three at the Gettysburg Tri-Match on Sept. 14. Three of the team’s top players are studying abroad this semester, giving players who normally don’t get to see competitive action a real challenge. “Its great to see some other players get a confidence boost and real experience,” said Marini. Cameron D’Amica, a first-year who has placed well at all of the Bullets fall events, attributes some of team’s continual success to playing teams that aren’t as talented. However, according to Marini, come springtime, the competition and intensity on the course amps up. The team practices roughly three times a week at Hanover Country Club, either on the range or out playing nine holes. “It’s easy to balance schoolwork with practice and events,” said D’Amica. The team also enjoys breakfast and dinner together before practices and events, helping one another on the course and in academic life. When the weather keeps them inside, the team uses a TrackMan system to maintain their skills. A TrackMan uses advanced software to track a players’ swing data and simulate ball flight. “It tests us on accuracy shots like we encounter on the course,” said D’Amica. D’Amica said the team’s coach, Susan Konstalid, has been emphasizing mental toughness, something she said her high school coach didn’t cover. “18 holes is a long time mentally on the golf course, so coach gives us things to think about to make sure we’re prepared,” said D’Amica. That mental toughness combined with dedicated practice and raw talent has created a tradition of winning for the Bullets in conference. “I think there’s definitely an intimidation factor when we play, and I feel like other teams are often out to get us,” said Marini. As a unit, the team knows the drill: to keep the tradition of winning Centennial crowns. They have a goal to “sweep the leaderboard” this spring and have all five competitors place in the top five. Marini and her fellow seniors are looking to go out on top with the squad’s ninth consecutive conference championship and another trip to Nationals, “We were lucky and honored to be in environment with professional intensity, she remarked. Before the fall season ends, the Bullets have one final event on Sept. 30 at the Links at Gettysburg.